I always liked bowling in real life, going to the bowling alley and competing with my friends, so a game about bowling game was always at the back of my mind. And when I finally got down to make a Bowling game, I wanted my game to be one of a kind. Result: Knockout Bowling. This is my first 3d game for the mobile market. Before this I have made two games for kids, one is called puppet pals which was made in 2d. I game designed and published this with two other companies and the other was candy treasures for tutotoons, a UK based kid’s gaming company. 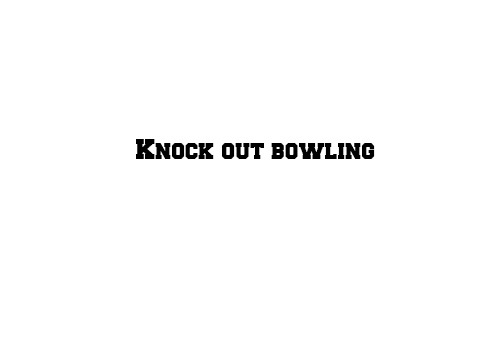 Knockout Bowling is a fast paced, fun and exciting bowling game developed for both IOS and android users who enjoy bowling. Simple to play and quite realistic, this game offers the players a realistic bowling experience that will get them hooked from the first strike. Bowl like never before and test your own bowling skills or even compete against others. Just choose the game mode you want to try and swipe on the screen to bowl and knock out the unique bowling pins to win your scores. This bowling game offers three different exciting scenarios and as a player you can also choose from three modes. The single player mode to test your bowling skills, player vs machine mode to challenge you even more or the local 2 players mode to compete against another on the same phone. That’s not all, the game offers you the chance to choose from a variety of bottles or bowling pins to knock out. Customize your game even more by choosing the texture and the color of the ball. All these choices will guarantee you hours of fun bowling. The scoring system is also different in this bowling game. For each strike you get 15 points, unlike 10 points in normal bowling games. And when you get a spare, you get 12 points instead of the score being added to the next frame. One more exciting feature of this game is that you can rotate/move your phone to left or right to make the ball go in that particular direction. Please note that this happens only after you swipe the ball.